February 2015 – Human Study e.V. Copyright © 2019 Human Study e.V. Help us in our efforts to enable the Syrian students to continue their studies on a higher level and become qualified P&O teachers and trainers in their region. Foot prosthetics is a small but very complex field of orthopedic technology. This prosthetic design and concept developed by Mr. Bellmann is both functionally ingenious and intriguingly logical. In this seminar, we teach the implementation of all practice-relevant aspects of the Bellmann partial foot prosthesis method. The aim of the course is not only to provide relevant knowledge on that amputation level and related biomechanical aspects, it is also to acquaint the participant with a contemporary production of ankle-free forefoot prostheses, where effort and effectiveness are in an acceptable ratio. During the onsite hands-on clinical seminar, following video, lecture and live demonstration, all clinical application, from evaluation and negative plaster casting to the rectification of the positive, fabrication, finishing and fitting of the prosthesis, is then performed by all participants with actual partial-foot amputees. This course presents knowledge and skills on prosthetic designs and concepts that apply to amputation levels from trans-metatarsal amputation to Syme amputation. Anatomy, Pathology and Biomechanical aspects are the theoretical fundament that lead to prescription and design of the appropriate prosthetic concept. Participant will exercise the full production process of various types of forefoot prostheses during the clinical hands-on workshop onsite. This course offers the participant the opportunity to develop and strengthen the theoretical and practical field of prosthetic care after transtibial (TT) amputation. This course provides broad knowledge and skills in the fabrication of condylar suspended transtibial prostheses with a soft inner socket. 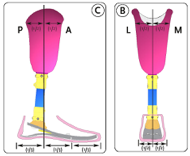 Further more, liner techniques for transtibial prosthetic designs and the application of high dynamic prosthetic feet complete this comprehensive program. At present, diverse clinically variations of the Ischium Containment (IC) socket design are used. The integration of the ramus os ischii into the shaft is considered to be beneficial due to its functional and biomechanical advantages. 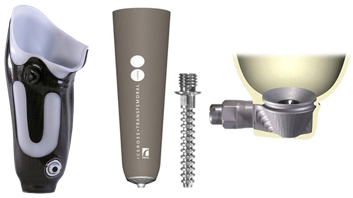 Ischium Containment socket design was developed to address the needs of patients looking for a better cosmetic appearance with greater freedom of movement in the hip and optimized prosthetic control. The theoretical introduction will provide you with knowledge on the basic aspects of the IC sockets and the distinctions to traditional transfemoral sockets such as the Quadrilatteral socket concept. This course offers the participant the opportunity to develop and strengthen the theoretical and practical field of prosthetic care after transfemoral (TF) amputation. The program focuses on the application of liner suspension techniques and the application of advanced components (knees, feet) for patients with high mobility demands. This course provides broad knowledge and skills in the fabrication of liner suspended TF prostheses. Furthermore, the application of high dynamic prosthetic knees and feet complete this comprehensive program. This course offers the participant the opportunity to develop and strengthen the theoretical and practical field of prosthetic care after knee disarticulation (KD). 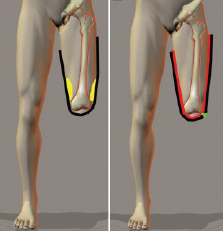 The program focuses on the application condylar suspension techniques, but also provides knowledge on the application of liner suspension and advanced components (knees, feet) for patients with high mobility demands. This course provides broad knowledge and skills in the fabrication of condylar suspended KD prostheses. This course will not only provide advanced knowledge on theoretical aspects, but will guide you step by step thought the fabrication of a hip disarticulation (HD) prosthesis. Please note that this technique excludes concepts for hemipelvectomy amputation level. The program introduces a technique that avoids the usual pressures at the gluteal and anterior region of the stump. The techniques presented by this course present a solution for a more anatomical and functional socket design. This course provides participants with knowledge for prosthetic solutions of transradial and transhumeral amputation level with focus on myo-electric applications for functional arm prosthesis. After the online based studies and preparations, participants will receive hands-on training in techniques taking measurements and casts and conduct of a Myo test on transradial and transhumeral amputees. The learned is then put into practice on patients during the clinical onsite hands-on seminar and the process of producing myo-electric prosthetic devices will be applied. Total contact casts need to be included here for the Australian and New Zealand Setting. Andrew Jolly would be a great trainer for this. The clinical picture indicating the application of a foot orthosis (FO) or and ankle foot orthosis (AFO) presents itself in very different manifestations. The complexity of the diseases requires a differentiated analysis of the actual situation. Based on this, the treatment goal must be defined in consultation with the physician and/or the therapist, and then implemented in the design. The course provides an understanding of the functional anatomy of the lower limb and the requirements of individual pathologies. Furthermore, the effects of different paralyzes on the gait are explained and the possibilities of gait improvement by orthotic devices are presented. 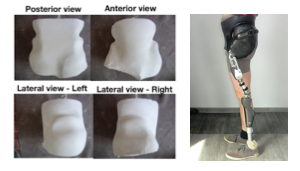 The UCB-ST Orthosis presents the fundament for de-rotation of the entire lower extremity and therefore will be introduced prior to the application of the AFO and GRAFO concepts. The course provides knowledge and clinical know-how on the de-rotation orthosis (UCB-ST) to address calcaneus valgus deformities and the application of different types of AFO’s to address the relevant pathologies accordingly. During the clinical hands-on workshop participants will learn techniques on measurement and casting, model rectification and the production process of the different orthotic concepts. By fitting and testing the devices, gait analysis and outcome measures will conclude the workshop. 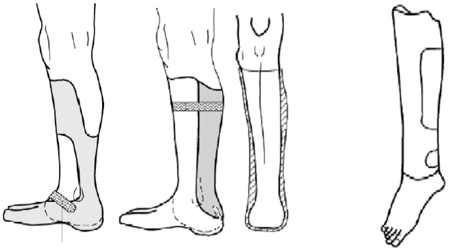 The clinical picture indicating the application of a knee-ankle-foot orthosis (KAFO) or and hip-knee-ankle foot orthosis (HKAFO) presents itself in very different manifestations. The complexity of the diseases requires a differentiated analysis of the actual situation. Based on this, the treatment goal must be defined in consultation with the physician and/or the therapist, and then implemented in the design. The course provides an understanding of the functional anatomy of the lower limb and the requirements of individual pathologies. Furthermore, the effects of different paralyzes and deformities of the lower extremities on stability, balance and the gait are explained. The course provides profound knowledge and clinical know-how on the application of KAFO’s to address knee deformities and leg length discrepancies in combination with various indications of paralysis. Aspects and inclusion of the hip will also be applied and concepts of HKAFO’s are explained and demonstrated. The clinical presentation indicating the prescription of a knee-ankle-foot orthosis (KAFO) or and hip-knee-ankle foot orthosis (HKAFO) presents itself in many different manifestations. The complexity of the impairments require an effective, tailored client assessment. Based on this, the treatment goals must be defined by the client in consultation with the physician and / or the therapist, and then implemented in the design. The course provides an understanding of the functional anatomy of the lower limb and the requirements of individual pathologies. Furthermore, the effects of different pathologies and deformities of the lower extremities on stability, balance and the gait are explained. The course provides advanced instruction and clinical know-how on the application of KAFO’s to address knee deformities and leg length discrepancies in combination with various indications of paralysis. Aspects and inclusion of the hip will also be applied and concepts of HKAFO’s are explained and demonstrated. Various concepts and designs incl. 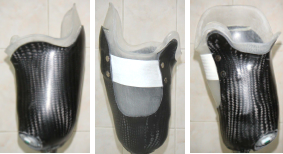 Tonus Reduction Orthoses. The treatment of postural and motor deficits in patients with motor and perceptual disorders requires a very detailed knowledge of the motor and neurological systems and experience in the individual application of treatment principles. Within the theoretical part of the course essential concepts of therapy are conveyed through a set of multi-media lessons. The aim is to explain the effect of the dynamic foot orthoses on the control of tonus and movement, balance and stability as well as the sensory system. The practical hands-on workshop will then focus on the clinical application of the acquired knowledge. Each work session is demonstrated and then implemented by the participant. After the appropriate model technique all steps of the DAFO production process are conducted and participants learn how to apply exact adjustment to arrive at optimal results. The course covers theory und principles of brace technology and treatment according to the brace classification system developed by Spine Concept Sobernheim. Participants get hands-on clinical education and training on patient assessment, blue-print analysis and the full manufacturing process of the spinal brace including outcome measures. Welcome to Human Study e.V. Here you can learn more about the educational opportunities in prosthetics and orthotics that we have to offer. Human Study e.V. is a German based non-profit organization with more than 10 years of experience in delivering prosthetic & orthotic (P&O) education by means of a specific blended learning methodology. Our blended learning methodology effectively combines the e-learning practices with on-site hands- on clinical workshop seminars, allowing the participants to study and at the same time stay productive in their workshop facilities, treating patients and keeping a regular income. The educational programs that we offer are internationally recognized Category II and Category I / Bachelor Degree level programs, accredited by the International Society for Prosthetics and Orthotics (ISPO). In addition, we developed a set of Specialized Courses – SCOPe – to address needs and interest in Continued Professional Development. The delivery of our comprehensive educational programs has been a positive experience and presents a steady progress in the development of customized and innovative blended education since 2007. Owing to the expertise we have thus acquired, we set about to develop an opportunity of offering the blended learning education in P&O on a higher academic level. The aim of this development has been to create generations of teachers and trainers within the profession, to provide more sustainable solutions to the shortage of qualified personnel in the world. Enjoy scrolling through our page where you can find further information about our programs, specific blended learning methodology, conditions and requirements for enrolling into our programs, and other information that will help you learn more about the work of Human Study e.V. If you are interested in becoming a student in one of our programs or if you would like to support our work and help our mission, please write to us and we will be happy to respond. Christian has founded Human Study back in 2005 and is leading the organization as Managing Director since. By background he is a Prosthetist/Orthotist. He graduated in Germany as "Orthopädie Techniker Meister „ in 2001. Snezana Rajacic , IT Manager, leading IT team. Works also as a teacher of Mathematics and Statistics in Human Study Bachelor program. Graduated Mathematics at Belgrade University, Serbia.